Summer is a time when kids get to kick back and enjoy their carefree days, making memories that will surely last a lifetime. 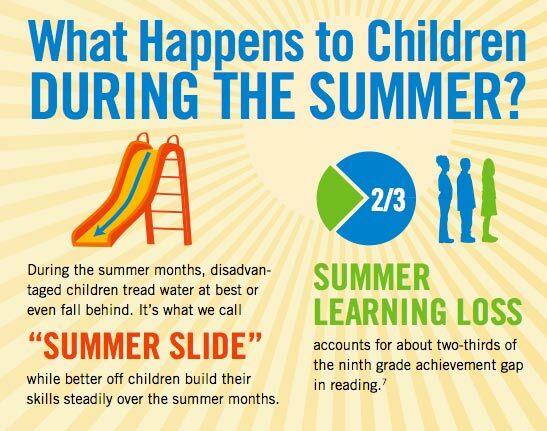 However, not being in school for 2 consecutive months, also has a huge downfall, more specifically the “summer slide.” Experts agree that those children who read during the summer acquire reading skills, while those who do not often slide backward. The good news is that research indicates that reading just six books during the summer may keep a struggling reader from regressing. The trick is to make sure these books are on the child’s independent reading levels, so that they are not too easy or too hard. Below I have outlined a few summer reading programs that offer kids incentives to continue to read over the summer, avoiding the summer slide and getting rewarded all in one! Step 1. Read any 8 books and record them in the Reading Journal PDF. Step 2.Bring the completed Reading Journal to your local B&N store. Students who read all summer long and log it on their recording sheet, can visit a local Pottery Barn store and pick up a free book! Kids 14 and under can earn free Half Price Books gift cards if they read for at least 300 minutes from June 1 to July 31, 2014. With this reading program students who complete the program by reading 10 books, earn $10 free! This summer reading program runs June 1 – August 31. On this site are many different rewards certificates that earn children 10 free play tokens! The reading certificate requires students to read each day for two weeks.